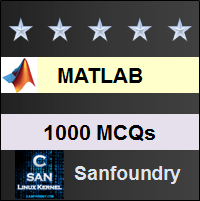 Our 1000+ MATLAB questions and answers focuses on all areas of MATLAB subject covering 100+ topics in MATLAB. These topics are chosen from a collection of most authoritative and best reference books on MATLAB. One should spend 1 hour daily for 2-3 months to learn and assimilate MATLAB comprehensively. This way of systematic learning will prepare anyone easily towards MATLAB interviews, online tests, examinations and certifications. Who should Practice these MATLAB Questions? The section contains questions and answers on arithmetic, algebra, input and output, variables managing, input errors, variables and assignments, solving equations, functions, graphics, statistics, plotting multiple curves, vectors and matrices. The section contains questions on matlab interface, m-files, loops, presenting results and fine tuning. The section contains questions and answers on suppressing output, data classes, functions and expressions, complex arithmetic, linear systems, differentiation, integration, limits, sums and products, default variables, random number generation, sparse matrices, fourier analysis and filtering. The section contains questions on two and three dimensional plots, customizing and manipulating graphics. The section contains questions and answers on branching, loops, logical expressions, input and output parsing commands, evaluation, debugging, user input and screen output. The section contains questions on modeling and simulation. The section contains questions and answers on calling external functions, toolbox distribution, system commands, performance and memory. The section contains questions on wrong or unexcepted output, syntax and spelling errors. The section contains questions and answers on laplace transform, impulse response, control systems time response. The section contains questions on signals operations, convolution and z transform. If you would like to learn MATLAB thoroughly, you should attempt to work on the complete set of questions and answers mentioned above. It will immensely help anyone trying to crack an exam or an interview. Here’s the list of Best Reference Books in MATLAB. Wish you the best in your endeavor to learn and master MATLAB!